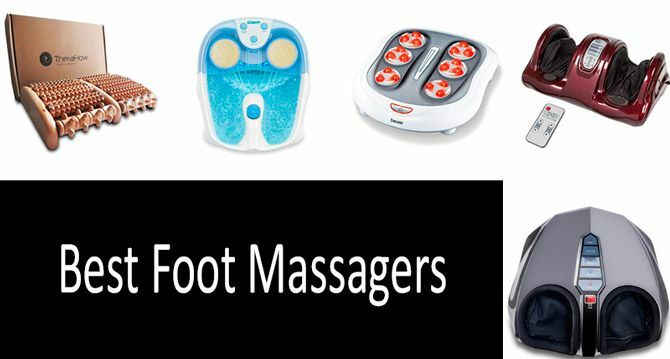 What is the best foot massager? In fact, much depends on your health condition. Do you often experience foot discomfort? Do your toes become hard? Do your limbs hurt? Knowing the area of pain, you will be able to choose a device that is right for you. And yet, there are some features which determine the best choice. The product should be comfortable, have easy-to-use buttons and a remote control. The best option should include speed controls so that you could regulate pressure. And it should be a brand-name product because you will trust your health to this device. We believe that Miko Shiatsu Foot Massager fits these criteria best. Why have we chosen this product? This is a model of a trusted brand that delivers a shiatsu massage both to bottom and sides of your feet. It has 2 chambers and 5 pressure settings. The product is very convenient to use as it comes with 2 wireless remote controls. Portability and a washable cloth cover add to its usability as well. Do you suffer from foot fatigue, aches, cramps and constant swelling? Perhaps, you cannot fit into your shoes or boots and you stare in horror at your protruding veins and thinking of either taking a vacation or losing some weight. You feet condition is a result of tireless work and constant bustle that has become an integral part of everyone’s life in the XXI century. Swelling and varicose veins are caused by hundreds of reasons ranging from wearing high heels to working while standing. This comparative review covers 12 foot massagers, such as plaque ones which are designed for feet massage or immersion foot massagers gripping on ankles or calves or whirlpool spa and find out which ones are suitable if you are a plantar fasciitis, neuropathy, Raynaud syndrome or diabetes patient. What Is the Best Foot Massager for Treating Plantar Fasciitis, Neuropathy, Raynaud Syndrome And For Diabetics? Masseurs keep on experimenting with the ancient Japanese acupressure technique, better known as the Shiatsu today. But pro shiatsu massage is very expensive. An electric foot massager overcomes these two drawbacks at once as Shiatsu becomes an accessible everyday enjoyment and therapy, and the costs are limited to the massager cost, not to mention the fact that we get a lot of perks, such as unearthly pleasure from our most loaded body part finally getting some rest, from the touch of cool water if you use the whirlpool, from toning pricks of a wooden cylinder’s sharp edges or from deep kneading with shiatsu-balls ... there are many options, which one should you pick? First, let's figure out what the massagers actually are. While the engineers have only designed two types of Shiatsu massagers for the neck, our feet proved to be luckier. Mechanical roller massagers made of wood, stone or jade were invented in ancient China as it was there that doctors discovered that the feet are the focus of biologically active points. And for that reason alternative medicine says that proper feet sole massage can cure heart and lung diseases, improve blood circulation and relieve migraine. This is indeed true and perhaps is the reason why Roller feet massagers still are popular. They are mechanical and are intended for industrious people who would love to preserve the traditions of Eastern culture. Electric massagers are the most numerous ones today on the market of foot care devices. Some of them use heat, vibration, air pressure, or Shiatsu-balls; others use water or gel to gently relax tired feet. There are 4 techniques inherent to classical massage: stroking, rubbing, kneading and vibration relaxing. While the vibrations help relieve muscle spasm tension, deep kneading allows working the muscles and intensifying blood circulation. Therefore, Raynaud syndrome, neuropathy or diabetes patients with disturbed vessel microcirculation, require a strong foot massage, to rush their blood to their limbs. Small amplitude circular rubbing provided by orbiting Shiatsu balls is recommended for diabetics. If you suffer from plantar fasciitis, make sure you perform daily self-massage along with using a massager. The aim of the massage is not only to improve the blood flow to speed up microscopic ruptures’ healing, but also to stretch the fascia. Let us warn you that pain thresholds are very individual, and someone might perceive shiatsu balls as too rough, feet are so individualized that it's unfair to expect perfection from a foot massage machine. Still, in any case you should realize that any massager is an artificial imitation of professional hands, so before using a massager on your own, make sure you consult a physician! 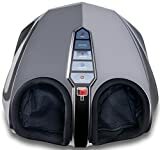 There are immersion foot massagers when you’re supposed to insert a foot in the massager (its depth varies from ankle to knee) and plaque which massage feet only. We’ve compiled the review in accordance with this classification. We’ll start with a classic mechanical foot massager with wooden rollers. Eight spiked theaceae wooden and two finger rollers for heels allow for simultaneous massage of an entire foot. This massager is the closest to Shiatsu. It intensifies blood circulation, acts on the acupressure points on your feet and relieves feet fatigue. The robust, steady and reliable TheraFlow Dual Foot Massager Roller can be considered an inexhaustible source of vitality as over 800 positive customer reviews will justify this. You can use it without taking your socks or tights off if you are confident in their strength. It is washable and mobile as it weighs only 1.6 pounds. If you merely need a warm and effective massage, then here it is, an austere white Beurer Foot Massager with 18 rotating massage balls, two modes, mesh surface and a solid body with legs that allow you to adjust the angle… And what could be more important than that if you want to read a book leaning back on the couch during the massage? This is the choice for those who value their money, time and nerves. No wonder the buyers rank this massage device highly. A more stylish and expensive massager with the same 18 massage balls will assure your tired feet’s enjoyable relaxation while having strict design. Check out the Homedics FMS-270H Deep Kneading Shiatsu Foot Massager. Here the entire massage principle is completely different as you will find a flat surface dotted with truncated pyramids and no externally visible moving parts. By default, it is believed that vibration massage should be done on bare feet, in the best case in socks, but MedMassager Foot Massager allows you even not to remove your shoes. The manufacturer promises that with 11 Speeds from 1 000 to 3 700 rpm, the massager would still make its way to the most tender points of your feet tired after jogging or cycling. These are not plaque but immersion foot massagers working bottom and sides of feet, ankles and even calves (if we’re speaking about the most expensive one). We’ll start with cheapest and most popular massager. This is a typical Shiatsu Foot Massager with 4 auto modes and various forms of massage including pulsing, kneading, and rolling. You can pick what you want to massage: toe, arch or sole. There are 4 colors available: royal red lacquer, burgundy wine, black and princess pink. As for the negative feedback, you’ll find something along the lines of “for the price this is ok”, “it does hurt if you are sensitive”, and many complaints of the massager either breaking down or not turning on at all. Frankly speaking, though, I should say that expensive items are also guilty of such shortcomings. This is the cheapest massage in this category and it is a best-seller. Apparently that is why many customers choose to ignore its drawbacks and hope they will end up with a high quality functioning device. This beast looks like a virtual reality system, but, in fact, it’s just an advanced and rather sophisticated shiatsu foot massager. The design is certainly ultra sleek and super polished. The item also features 5 different pressure settings that target specific pressure points: there’s a shiatsu rolling massage thing that gets to the toes, a few rollers for the arch of the foot and the heal, and an air pressure cushion on top, which inflates and deflates. On the highest setting this beast will be pretty intense, so don’t go in there first, start from the lowest setting and see how you feel. The manufacturer claims the massager would help with plantar fasciitis, chronic pain, muscle tension, tough knots, and other aches, and judging by the happy consumers’ reviews, it, in fact, delivers on its promises. Prepare to spend more than 100 dollars, though. But … it’s just a heads up, totally recommend! «I had tried a foot massager at Brookstone-- LIKED IT. I have diabetes and also foot neuropathy is a worry for those with diabetic issues. I was dedicated to obtaining a foot massager, checked out the reviews on Amazon as well as decided on the Miko Shiatsu Foot Massager ... LOVE IT!!! It's practically half the rate of the Brookstone design as well as every bit as excellent. I have actually had it much less than a week and utilize it every night. I've seen an incredible uptick in my energy as well as can't suggest this item as well extremely. It's terrific. My spouse has plantar fasciitis, and I encouraged her to use the foot massager. It's currently a nightly ritual for both of us. Aside from the foot massager being an excellent item, I think this company is also a terrific company with a solid passion in their customer and also not just at acquisition yet their follow through too. 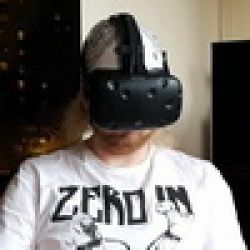 We obtained an e-mail checking right into our complete satisfaction with the product and also guaranteeing us that if there is any type of problem that they will fix it promptly. There's no problem, just this client's great contentment and also gratitude for the Miko Shiatsu Foot Massager». Not only does 3Q Foot Massager can knead and heat, there is also Air pressure massage (with the three level intensity from strong to weak) available which creates a feeling of soft pressing with a palm and you can recreate a feeling of a real massage if you use your imagination a bit and relax. The massager is also distinguished by the fact that it barely massages heels, but pays lots of attention to toes and foot arches which are the most vulnerable spots. Still, a number of issues reduce the popularity of this product considerably. Some customers complain of monotony of the ever-same massage program. It is boring and becomes tiring fast enough before turning annoying. Secondly, few people enjoy additional stimulation of their toes and foot arches as it often causes painful sensation. Brookstone Shiatsu foot deep kneading massage rollers & air compression works very intensively and intensifies blood circulation. All of the pain caused by fasciitis or neuropathy will be relieved. The massager provides a variety of programs, as the 3 auto massage programs are Soothe, Pulse, and Energize. Many dislike the way it squeezes their feet, but then everyone has individual air compression sensitivity. This most expensive massager grasps 360° of your leg and can massage your feet, ankles and calves simultaneously. Foot massage and calf massage can also work independently. You can choose either one or both of them. The massager resembles sophisticated airplane twin seats with its red lacquer, soft cloth and PU leather. As for the functionality, we should mention infra-red heat which will be enjoyed by those who are constantly freezing and massage rhythm than can even make a senior feel what it’s like to have young and healthy legs again. «I use this massager every various other day to eliminate ankle as well as foot pain. I get on my feet 8 hrs a day as a storage facility worker as well as the discomfort under of my feet is intense. This is well worth the financial investment. I have large calves in the 15-17" and also size 10-1/2 feet. A lot of space left for bigger feet. Heating system is a little sluggish to heat up yet it does assist with the relaxation. Best choice around under $200». Finally, we have got 3 foot spa. Two of them are for pedicure. Personally we love the third one most: it is a bright Orbeez device with gel balls, very entertaining for kids and adults who lack holiday in their daily life. This affordable massager is almost a full=scale home spa kit with its three pedicure nozzles, two bubbles modes, heating, blue diode lights, and the expensive version is even equipped with a waterfall ... If you want to buy a reliable King Titan style device, this is what you need - read over 1400 customer reviews to be sure. However, Conair Waterfall Foot has little to with massage as it only has two side rollers. Relaxation is achieved by water and heat, the therapeutic effect is therefore small. This item costs 2 times higher than the previous massager, but to compensate it is now equipped with four pressure-node rollers, curved and located in such a way that they massage not only your toes and heels but also your feet’s arches which becomes a great prevention of flatfoot. The water is heated to 98° F, which is the standard body temperature. This creates a sense of feet soaring in weightlessness and a blissful feeling of relaxation and peace. If you’ve been looking for a kids’ hydro massage or for some fun, here it is: Orbeez is filled with 2000 gel balls, and not water. They are bright, colorful and iridescent; they jump around your feet creating a carnival ambience. It is very suitable for those who lack holiday in their daily life. This massager a coveted gift for the kids, as many buyers write: "Kids love it!" Of course, it has nothing to do with full massage or pedicure as the Orbeez massager’s therapeutic effect is purely psychological. Still, honestly, have you ever craved bursting these colorful balls that resemble gemstones? Q: Can I use a foot massager while pregnant? A: Well, if you’re overdue, you can, in fact, use the foot massager to help induce labor. But, honestly, if you’ve just recently got pregnant, do not try it. Q: What is the best foot massager for plantar fasciitis? A: We can safely recommend the following options for your condition: it’s the TheraFlow Dual Foot Massager Roller and Miko Shiatsu Foot Massager. Q: What is the best foot massager for neuropathy? A: All of the described options are good for diabetic neuropathy. Specifically, you might benefit from a shiatsu massage like the one delivered by theMiko Foot Massager. Q: What is the best foot massager to help blood circulation? A: All of the described products on our list will help you to stimulate blood circulation, so choose whatever option best suits your taste and budget. Q: What foot massage to relieve a migraine would you recommend? A: All shiatsu types would be good to help relieve pain associated with migraines. Here's a brief story for you: my long diseased grandma, who died when she was 94, always said that the secret to a long and happy life was sleeping on a flat firm and hard surface with an acupuncture mat. The reason I am saying this is because she suffered from migraines in her thirties and as soon as she started using the mat, she felt better and better. She would also take the mat in the morning, put it on the floor and stand on it for a few minutes, then trod here and there on it, before continuing with her morning routine. I tried to find that mat online, and here’s what I found:Acupressure Mat & Pillow. The mat looks exactly like the one my granny used to use. It’s cheap, but trust me, try it and you'll see for yourself. They can’t. Their design requires compulsory water or gel balls (of certain consistency) use. Can hydro massagers be used without water? By all means you can’t. All the massagers are intended for humans only and are designed for human muscle elasticity and anatomy. Never bathe your pets in a hydro massager or massage them with conventional massagers. Gel balls which replace water in some devices must be kept away from pets and children. Can I massage my dog with a foot massager? Decide on your problems and needs. If you need cheerfulness after a Shiatsu massage, go for mechanical massagers; if you want to get rid of fatigue and a burning sensation in the feet choose a hydro massager; immersion massagers will relax your exhausted feet as they are a kind of mini-massage chairs. Finally, to get the maximum health benefits pick a pillow-like plaque massager. Some massagers look strange and unusual, but what if they are exactly what I need? How to choose one without trying? Of course, it doesn’t. Beauty parlors offer hydro massage as an additional service which can be combined with pedicure as required. At home you can and should use a hydro massager if you feel your feet burning after a long working day. You will not only relieve fatigue, but also get rid of the burning sensation in the feet with the boiling water. Hydro massagers are often used in parlors. Does that mean they are not for home use? No, it’s just a nice perk for those who want to feel the touch of natural materials. Mechanical massagers are necessary for those who want to control the massage process inside and out, it does not require heat or for those who, for instance, are located in an area where there is no electricity. The therapeutic effect of mechanical massagers is just about the same as that of the electric ones, but they lack relaxation we get when completely surrendering to the arms of a Shiatsu massager. Mechanical massagers are made of natural wood. Does that make them more helpful than the electric ones? Although all manufacturers claim that their massagers fit up to size 12.5, you’d better opt for a plaque foot massager, such as HoMedics rather than an immersion one. Which massager should a big foot man pick? Doctors prescribe massage for diabetics; however, if your legs are covered in sore ulcers, the massage is contraindicated! In any case, before using the massager you should consult your doctor! There are many other diagnoses which make massage undesirable or even dangerous. If a patient is pregnant or has recently given birth, has a heart condition or a pacemaker, suffers from diabetes or other sensory impairment, phlebitis and/or thrombosis, joint dysfunction, inflammation or injuries, weak bones, osteoporosis, a high fever, an abnormal or curved spine, is at an increased risk of developing blood clots, has pins/screws/artificial joints or other medical devices implanted in body, is being treated for a medical condition or physical injury you should consult your family doctor! Can diabetics use foot massagers? Some labels say they can, others say they can’t.